Squirt is a 10 year-old neutered male. 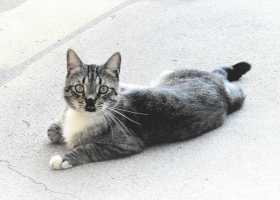 He’s a gray domestic short hair with black tabby markings and light green eyes. His chest, belly, & paws have white fur. He’s agile and spry; of medium build; and timid w/ strangers.